Terrydec look at the second link page I posted. If you look at the diagram it shows that the am radio is being used simply as a amp for the signal. The added on parts of two caps and the diode is a simple AF/RF probe. If you have parts laying around make a probe by that diagram and instead of putting it into a radio put a connector you can plug into your tracer. Its simple to make and may solve your problem. I have used that tracer for about 35 years and have never had issues. It turns out that I have been making a DC probe for a DVM. This is a cap and resistor in series with a diode from the junction to ground. The circuit I need has, I believe, a diode in series with a cap and a resistor to ground. My understanding of this may be on a simple level, but .... I have always thought of an "RF Probe" as a portable device that simulates a detector and passes the product to an audio amp so that it can be listened to (ie : a signal tracer). So, it seems to me that a diode in series, with a capacitor to filter the RF after the diode, leaving just the audio signal is all that an RF probe is? An audio probe has a DC blocking cap at the input and the signal does not have to be rectified (detected) before being sent to the tracer? As far as the placement of the diode .... whether you block the RF half wave or send it to ground, does it matter how it's rectified? There are people posting here who will correct and explain better than I.
willy3486 wrote: Terrydec look at the second link page I posted. If you look at the diagram it shows that the am radio is being used simply as a amp for the signal. The added on parts of two caps and the diode is a simple AF/RF probe. If you have parts laying around make a probe by that diagram and instead of putting it into a radio put a connector you can plug into your tracer. Its simple to make and may solve your problem. I have used that tracer for about 35 years and have never had issues. It looks simple enough but I couldn't get the value of C2. Is that diode a signal diode? I see C1 as 0.01uf, C2 as 0.001uf and D1 as a 1N34 which I think is a germanium signal diode? I can't imagine that the cap values are super critical ... almost anything close should work? Great. I need to get a new diode from Radio Shack but I'm definitely going to try this. Yes, these are the values. Well... I bid on another Tenma like mine , only with a probe. Once again I bailed out at $80. It went for $102. Too rich for my blood. I got mine for $45. I have my eye on a Heathkit in really good shape. I'm beginning to hate auctions. terrydec wrote: Well... I bid on another Tenma like mine , only with a probe. Once again I bailed out at $80. It went for $102. Too rich for my blood. I got mine for $45. I have my eye on a Heathkit in really good shape. I'm beginning to hate auctions. With all the money I have spent to repair my GE Console I could have bought a new one. I am going to try once again with that Heathkit. I figure I'll just put in $200 and let the chips fall where they may. Then sell my Tenma. terrydec wrote: With all the money I have spent to repair my GE Console I could have bought a new one. I am going to try once again with that Heathkit. I figure I'll just put in $200 and let the chips fall where they may. Then sell my Tenma. Here's a link to the manual : http://www.pascalchour.fr/ressources/heathkit/it12.pdf The schematic and component values for the probe are shown in the schematic if you're interested. I'm looking forward to seeing how you make out with the auction. Thanks a bunch. It will sure be nice if I get that Heathkit. These probes all seem to be the same, a high voltage cap and a germanium diode. I think I can do that. I saw one probe that was built in a section of copper pipe. Theoretically, this should work. Not my best solder work. Wow, the Heathkit IT-12 on eBay just sold for $167.50! I hope you didn't spend that kinda money on it Terry! I got it. You are not going to believe this. $168.50. Now that the head rush has worn off, Ouch! Maybe I can get something for my Tenma. This had better all be worth it. BTW- Thanks for being my substitute Facebook. Thanks. I just printed it out. Okay- in my defense...I did just pay over $160 for a $50 tester. That might have been a little extreme. At least it is in excellent shape. Why have I done this? I have this great console that I have invested a LOT of time and effort in. It will work great but after a few days shut down. I want to be able to inject a signal at the antenna and trace it all the way through the circuit. Somewhere there is a bad resistor or cap and I'm gonna find it. Perhaps I can sell my Tenma while the market is so hot. Have you replaced all your capacitors? What do you mean shut down? Could be a bad tube, or, dirty tube sockets, also. 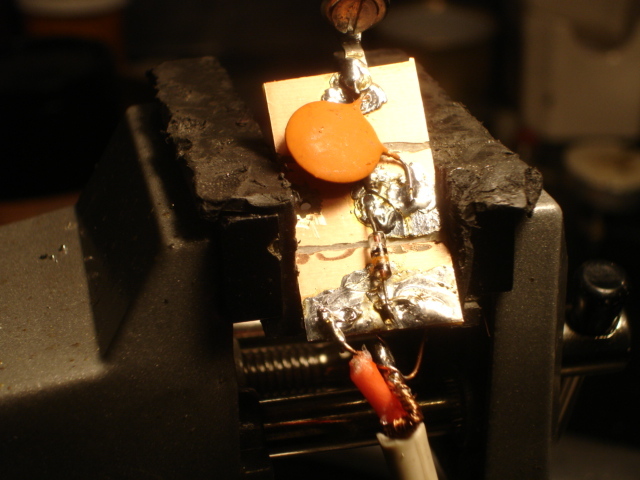 Bill Cahill wrote: Have you replaced all your capacitors? What do you mean shut down? Could be a bad tube, or, dirty tube sockets, also. I work on it and it starts to work. It works for several hours a day for a few days, then, usually when my back is turned, it just stops. There is another problem. Sometimes the volume will go up or down. I have replaced all of the caps in the RF area. I even removed the oscillator coil at some point. The 6SA7 is an NOS that I bought the last time I worked on it, a few months ago. That time I just changed the way the antenna was connected. This time I'm going to check the resistors. I might use some cold spray too. It is such a great sounding radio when it works. Okay--- The Heathkit came today and IT WORKS!!! There is some very light hum but I don't see any reason to recap it. Besides, it is very hard to get to the electrolytic caps. The kit builder's work was not great but acceptable. I'm listing the Tenma today at a buy it now price of $85. I don't know if it was worth $167. But at least I have one and I don't have to worry about it any more. It's good to hear that you are back in business. I think that the fun factor outweighs the dollar factor where hobbies are concerned .... so enjoy! John Bartley wrote: It's good to hear that you are back in business. I think that the fun factor outweighs the dollar factor where hobbies are concerned .... so enjoy! On radios when someone asks if it is worth it I say this unless the radio is just a huge ripoff and I tell them that. I tell them radios are not an investment unless you get cheap and flip it. I tell them if the radio is 50 bucks for it and if you will get 50 bucks or more enjoyment from it buy it. If you get less than 50 bucks of enjoyment then pass. This is a hobby , not a profession so look at the enjoyment factor. Good for you! It's always nice when things go our way ... for a change!